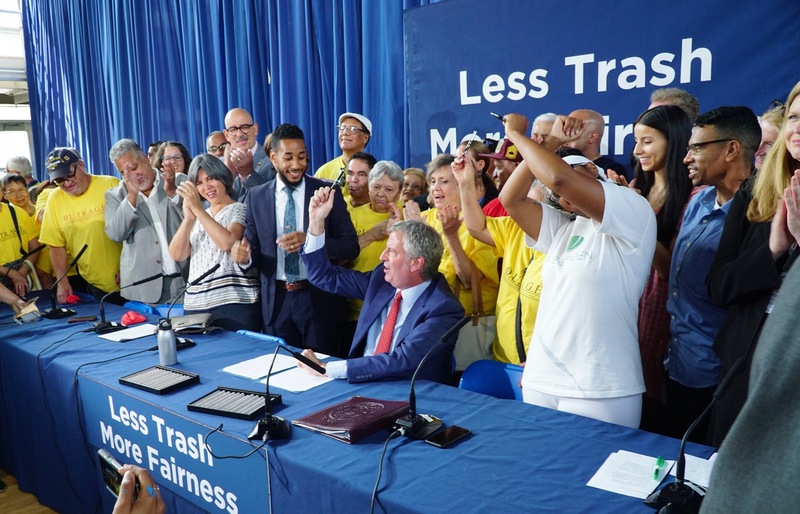 Today, Mayor Bill de Blasio signed legislation that will reduce the amount of waste that can be taken at transfer stations in four neighborhoods that bear the brunt of the city’s waste management infrastructure. Intro 157-C, known as the Waste Equity bill and sponsored by Council Member Antonio Reynoso, provides much needed relief to communities in the Bronx, Brooklyn and Queens that have disproportionately shared the city’s waste management infrastructure and will prohibit the creation of new waste transfer stations in neighborhoods that handle at least 10 percent of the City’s waste. “Low-income communities have been overburdened by the amount of waste handled for far too long. North Brooklyn, the South Bronx and Southeastern Queens have – for generations – been dumping grounds for this city’s waste. This law will place a limit on the amount of trash moving in and out of neighborhoods that for years have taken on an unfair burden. I thank Council Members Antonio Reynoso and Stephen Levin for their leadership on this and Mayor Bill de Blasio for his support,” said City Council Speaker Corey Johnson. The law reduces the amount of waste that can be processed at waste transfer stations in certain neighborhoods, and will dramatically reduce truck traffic associated with garbage collection in neighborhoods that have historically handled the majority of the city’s waste. Through this plan, neighborhoods including the South Bronx, Northern Brooklyn, and Jamaica will decrease their share of the City’s overall waste-collection capacity and will ensure that capacity is more equitably distributed throughout the city. The bill also restricts the construction of new waste transfer stations or additional permitted capacity in overburdened neighborhoods to ensure a decrease in truck-related traffic, pollution, and subsequent negative health effects on people living in those neighborhoods. Combined, these initiatives will decrease pollution-related health effects in neighborhoods in the Bronx, Brooklyn, and Queens while forging a more equitable sanitation infrastructure that balances infrastructural burdens across all boroughs. The law marks the final chapter of the City’s Solid Waste Management Plan, which will dramatically reduce truck traffic associated with waste collection and hauling in neighborhoods historically overburdened by waste processing infrastructure, including North Brooklyn, the South Bronx and Southeast Queens. DSNY estimates that this bill will move between 1200 and 1800 tons per day of waste out of these neighborhoods, which means 120 to 180 trucks per day (on average) that will no longer dump waste in these four overburdened community boards, and about 60 tractor trailers per day that will no longer haul waste out of these neighborhoods. In 2017, these four districts received a total of 15,045 tons per day of waste. See below. The bill will reduce the amount of waste that at private transfer stations can accept by 50 percent in North Brooklyn and 33 percent in the South Bronx and Southeast Queens. It also promotes the development of new recycling and organics processing capacity and provides exemptions for waste transfer stations that export waste by rail. The capacity reductions will take effect at each transfer station’s annual permit renewal beginning October 1, 2019. It also prohibits the creation of new transfer station capacity in the future in any community board that already has an unfair share of waste infrastructure. 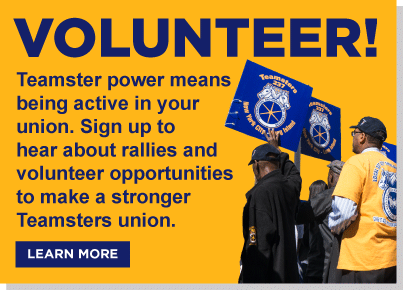 The bill requires the Sanitation Department to submit an annual report on waste transfer stations and create a voluntary displaced employee list for any employees of transfer stations that close as a result of this law. Today’s bill signing marks the final chapter of the City’s Solid Waste Management Plan (SWMP), which was adopted by the City Council in 2006 and is based on the concept of borough equity – that no borough should be responsible for managing another’s garbage. After the closure of the Fresh Kills landfill in 2001, almost all of city’s waste was exported by long-haul truck from privately-operated transfer stations. Because of zoning and siting restrictions, these stations were predominately located in three neighborhoods in North Brooklyn, Southeast Queens, and the South Bronx. As a result, these neighborhoods were disproportionately impacted with health concerns and other hazards associated with heavy truck traffic, including air pollution and increased risks for pedestrians and cyclists. The SWMP has dramatically reduced truck traffic associated with waste collection by moving away from transporting waste by long-haul truck, to transporting waste through a system of marine and rail transfer stations spread throughout the five boroughs. When completed next year, this new waste transfer system will reduce truck traffic associated with waste export by more than 60 million miles per year (including more than 5 million miles in and around New York City) and slash greenhouse gas emissions by 34,000 tons annually. The SWMP will also offer the city flexibility and resiliency in the case of a natural disaster or other emergency by providing a new world class infrastructure. Today, seven of nine long-term export facilities envisioned in the SWMP are open and operating, including two of the converted Marine Transfer Stations. In addition, the Southwest Brooklyn Marine Transfer Station is scheduled to open in the fall and the East 91st Street Marine Transfer Station in Manhattan is scheduled to open in spring 2019. “Since inclusion of a ‘fair share’ provision in the 1989 charter revision, City officials have recognized that some neighborhoods suffer disproportionately from environmentally undesirable facilities. Now, at long last, new legislation will begin to address this problem in three neighborhoods overburdened by privately operated waste transfer stations. Mayor Bill de Blasio, Speaker Corey Johnson and Sanitation Committee Chair Antonio Reynoso deserve public thanks for breaking the logjam and taking this welcome step for waste equity in New York City,” said Eric A. Goldstein, NYC Environment Director at the Natural Resources Defense Council. “The passing of Intro. 157 is a victory for our North Brooklyn community. By reducing the permitted capacity at waste transfer stations in overburdened districts, the city has recognized a piece of the environmental injustice puzzle that has been North Brooklyn, the South Bronx and South East Queens’ reality for decades. While this bill isn’t the solution to the deep inequalities present in our current waste system, we are pleased that the city has acknowledged these issues and have taken a step in the right direction,” said Jen Chantrtanapichate, Founder of Cleanup North Brooklyn.